Aziza Yorkshire Terriers is an established, small Yorkshire Terrier, Yorkie breeder based in Roodepoort, Johannesburg, Gauteng, South Africa. We are committed to breeding healthy, happy, well-socialized and quality Yorkshire Terrier, Yorkie puppies. Aziza Yorkshire Terriers is registered with the Kennel Union of Southern Africa. All our Yorkshire Terrier, Yorkie puppies are meticulously cared for, raised in a loving home environment and very well socialized. We do not keep our Yorkie, Yorkshire Terriers in cages or kennels - they are all pets in our home, have freedom and are deeply loved. We have been breeding Yorkies, Yorkshire Terriers for 15 years and we occasionally have Yorkshire Terrier puppies for sale to good and suitable pet homes. We can fly our Yorkie puppies to all major airports in South Africa (from OR Tambo or Lanseria airports in Johannesburg) at an additional cost. Aziza means “precious” in Swahili. The Yorkshire Terrier, fondly referred to as the Yorkie, is a breed of small dog classified in the Toy group by the Kennel Union of Southern Africa. 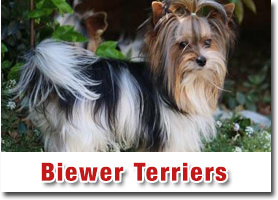 The long-haired terrier is known for its playful, spirited and even temperament. 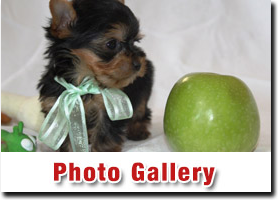 According to the breed standard, Yorkies, Yorkshire Terriers usually weigh not more than 3.2kg. Quite significantly different from what Yorkies, Yorkshire Terriers looked like hundreds of years ago, today’s Yorkshire Terrier have become ever smaller. The Yorkie, Yorkshire Terrier is undoubtedly one of the most likeable of all Toy breeds. 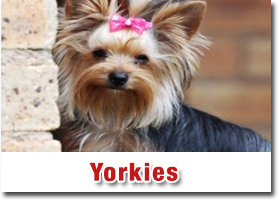 The Yorkie’s popularity in South Africa (and around the world) has grown tremendously over the last 10 to 15 years. Yorkies, Yorkshire Terriers are charming, intelligent, cheerful, full of courage (despite its small size) and life, very loyal and affectionate - they are true “Terriers”. Yorkies, Yorkshire Terriers spend a lot of time sprinting around, checking things out in and around your home, garden and often chases birds and butterflies. Yorkies, Yorkshire Terriers also thrive on human touch and attention - Yorkies, Yorkshire Terriers absolutely love cuddling on your lap, lying on the couch and sleeping on your bed. Yorkies, Yorkshire Terriers are compact, quite athletically built, and therefore active throughout their life. The Yorkshire Terrier stance is upright, far from frail or fragile as you may have expected when thinking about their small size. Yorkies, Yorkshire Terriers hold their head and tail high - showing all that confidence. This does not mean that Yorkies, Yorkshire Terriers are not physically frail - Yorkies are small, their bones are fragile and they can be injured or even killed when they are accidently stepped on, sat on (whilst curled up under their favorite cushion or throw on the couch or blanket or pillow on your bed) or if they jump off a couch or a bed. Because Yorkies, Yorkshire Terriers are small, they are ideal to go everywhere and anywhere with you. Yorkshire Terriers are ideal for people who do not have lots of space - they can live in a small home or apartment. Because of their “terrier” like temperaments Yorkies love running and playing around your garden or in your home (running big circles around your lounge or dining room). Loads of toys and distractions will keep the lively little Yorkies, Yorkshire Terriers mind busy and yourself amused and entertained for hours! Yorkshire Terriers bond quickly with their owners (more strongly with mature people and older children) and they enjoy being part of the family. Small children tend to make Yorkies nervous because they want to pick them up and carry them around - Yorkies find this constant and sometimes not so tender handling rather stressful. Yorkshire Terriers, Yorkies are fondly referred to as "Pocket Rockets” or “The Little Big Dog” because they believe they are much bigger and stronger than what they really are. Yorkshire Terriers are incredibly brave and alert, protect their territory and because of their excellent sense of hearing Yorkies will alert their owners at the slightest sign of trouble - perfect little alarms and watchdogs! Yorkshire Terriers, Yorkies shed very lightly (in fact only when brushed) and are therefore one of the best breeds for people who suffer from allergies and sinus problems. Yorkies are long-lived, very healthy (although they can have some conditions), can live up to 15 years - they need lots of love and continual attention. Yorkie Reuntjie of Tefie - die GROOT vraag! The big question - MALE VS FEMALE? Have fun with different Yorkie hairstyles! Watse kos moet ek my Yorkshire Terrier voer? Do Our Pets Really Love Us? Yorkies - ideaal vir mense met allergiee? Wees versigitg waar jy jou Yorkie koop! Choose where you buy your Yorkie puppy carefully! Die Yorkie puppies is 4 weke oud vandag! The New Yorkie Puppies are 3 weeks old! 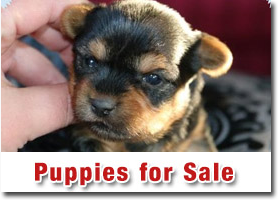 Yorkshire Terrier Puppies available - click here!